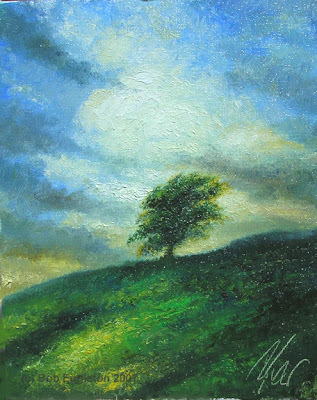 The Tree on The Hill(8x10, oils, SOLD!) I wanted to see some green, realizing it's now Spring. So I played around with clouds abit, and some greens and a tree. Note the contrasting angles of the landscape, and the clouds and that lovely texture. Nice little piece done in about 40 minutes. 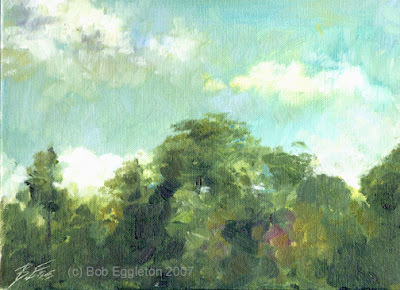 I like the clouds and how they came out, I'm sort of a bit influenced by the Barbizon school here, abit and more than just a little bit by George Inness, a painter of the past who did this luminous trees that always seemed to have this halo around them and really dramatic shadows. Here's a sketch out of my sketchbook for a commission I am working on. It's just, at this point, a good direction and will probably change 60%, but the concept is to do a Hudson River type painting, with a dragon in it. All very foresty and mountainy, waterfalls and all. So, look back at my romantic castles and landscapes and waterfalls in the forest...and you see how it all ties into a bigger picture of what I am doing. I've been looking at Claude Lorrain lately, a French artist (1604-1682) who spent alot of time in Italy was an expert draughtsman at doing amazing drawings before executing large canvases. 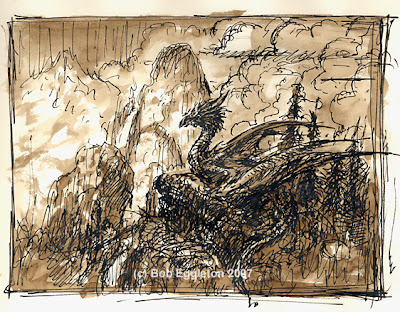 He used the medium of Sepia, which is in essence, brown ink applied with a crow quil pen, or brush. In this case I drew an ink drawing and wanted to give it some tone so I used sepia-Walnut ink. I like the "old" methods. This is abit sketchy but as I said, it's the first step in a larger commissioned work and things like this go through "stages" of development. This is sheerly compositional at this point, but, you get the idea. Enjoy! This gives you a peek into my earliest creative processes. Something else...I have CONFIDENCE with my oil painting!! 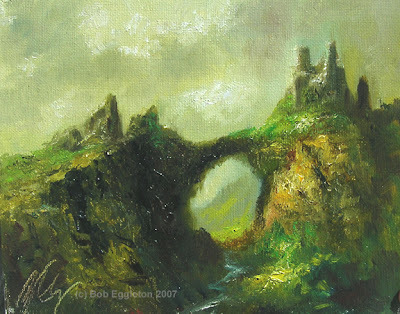 I have gained it back, thanks to this blog, and thanks to all the people who buy the little paintings here-I can't tell you how much it's helped me with my work. 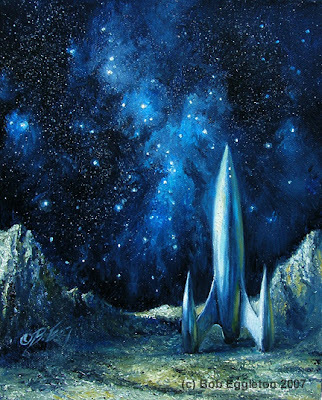 Retro Rocket 1(8x10,oils SOLD*) "Zero Hour, 9am...and I think I'm gonna be high as a kite by then.." Rocket Man-I love that song. And I love old, pulpy covers with pointed rockets on them! A quick painting, and I wound up using something I'd painted before, a space pen, to get the reflections right. I did this as a series of little paintings I am doing for RoqlaRue Gallery in Seattle, that I am part of a show there. I'll have a larger piece in the show, but as a sales incentive, these smaller ones will bolster that. UPDATE!!! I recieved a BUNCH of requests for this image or something like it. Not to worry. I LOVE painting these, so I plan to do quite a few in the future!!! So keep checking in and hang in there! Thanks! I got to play around with clouds abit more. I like the result. The paint is rather textured but I think the result justifies that. The object here was to play with clouds, sunlight, and some misty shores. I want to get more into the large, romantic type works. It's alot of fun to do these. I've been looking at Sargent's work again lately. There are worse things one can do with one's time. Working this way is like frosting a cake. 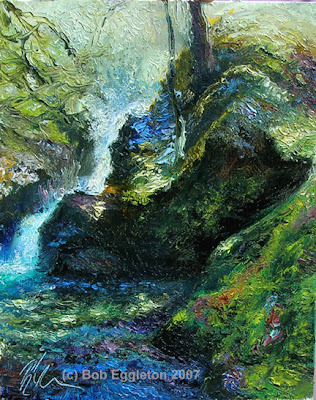 I'd say it's 90% palette knife here,based on some pics from Oregon and depicted in the previous "Falls In The Forest"(which I wrongly said was outside Seattle, this was in fact near Silverton Oregon), this is another angle of the same falls. I "edited" out a bit of the road at the top of the hill. Nothing wrong with editing your paintings if need be. I like how the foreground blue reflections came out, one of the transfixing wonders of painting water in motion. It's transluscent and...reflective. Getting that fleeting moment between the two is what is the magic. All in all, a nice little painting. I'll be doing some interesting stuff coming up, so stop back soon! Thanks! Here's a better look at the picture mentioned in the last post. You can see the subtle stuff here better. A note: again it's a weird, wacky week, so posts will be sporadic, so hang in there and visit my archives too! 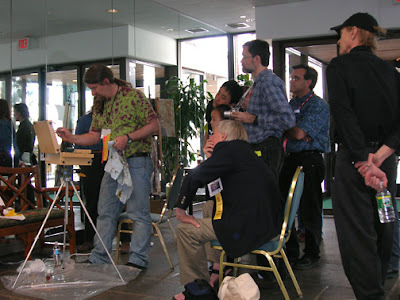 At Lunacon, Artist Guest Dave Seeley suggested artists doing live painting demos and he asked me to be in one on 2pm Saturday. 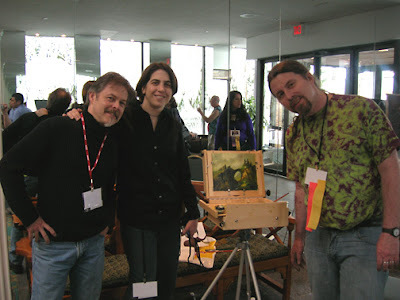 Other particpants included Donato Giancola, Dan Dos Santos and Greg Manchess. Lunacon was the 50th gathering of the New York SF Society, and usually alot of fun. This year was impeded abit by a monster Nor'easter of snow and sleet. We got there late but better a day late than never! Pictures-top down- Greg Manchess and Tor Books Art Director Irene Gallo and me. 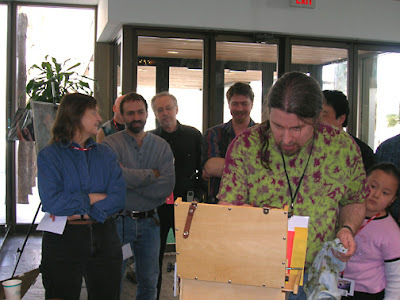 Middle-Donato Giancola(his own set up to the left) looks on adding the comment he liked the atmosphere I was painting. Bottom-Steve Hickman(right) and onlookers. This is the part I am scared I'll screw it up in front of everyone! But it all worked out. Here's the one-hour painting, I did out of my head. More on my classic landscape theme-lots of people liked it. I might post a better photo of this soon. It was great being around so many other terrific artists, and inspiring. Everyone inspired everyone else! 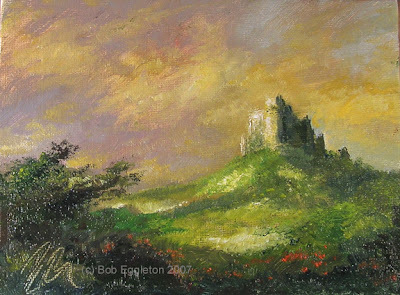 Castle Meadow(6x8, oils SOLD) I liked the idea of walking around some kind of lush meadow, around a castle. Just a fun little piece done in about 40 minutes, with palette knife and, on a somewhat smaller size than I normally work. I like working with the palette knife now, sometimes moreso than a brush. What I'll post next is the public painting demo I did at Lunacon this past weekend. Lots of fun!! I felt like some warmth. It's been 60 or 70 all week and now it's gone to the 30's and, it's snowing. Global warming, it's happening. I could also attribute this painting to the week I have been having. Yep, that kind of week still. Eruptions. Fun little painting. I have thought about painting alot smaller than I have been, and wanted to see how this would work out. Again, my love of volcanoes shines here. All in all, a 15 minute painting. 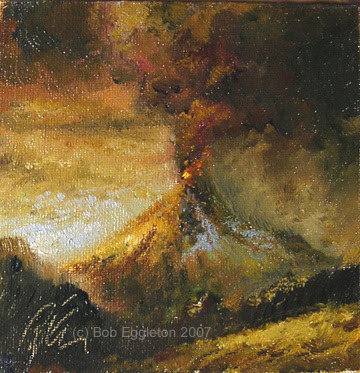 *Note on the price-this is a smaller piece, 5x5 and I have included a frame with it, that matches it. 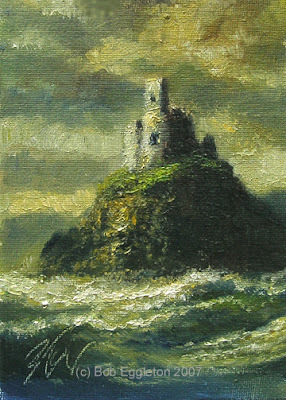 Castle of The Ocean(5x7,oils, $SOLD) I'm still in this rough seas mode. I watched a show on the Bee Gees late last night. Robin Gibb owns a castle(okay there's the connection). There's a group that got a bad rap thanks to the disco backlash. I like Disco, in truth. Fun, happy music. And The Bee Gees could do alot more than disco stuff. Anyway, the whole show took me back to 1977, when things were really, more fun than they are now. Why do people so often trash what they enjoyed long ago? I mean, this was really hot music and really fun times...so why apologize? Get over it, enjoy it, always treasure it. Oh well, we live with it I guess...I wanted to explore more of these rough sholes, sort of as an experment for something else. Got some nice texture going that is apparent here. The price of this is $100 and it includes the rather cool frame not shown, but will be on the piece for a show this weekend. 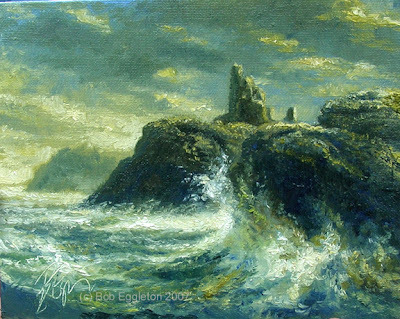 Storm Coast(8x10, oils, $SOLD!) This painting says alot for the way I have been feeling lately. It was pure joy to do. Some unknown coast, with a castle ruin(how appropriate). 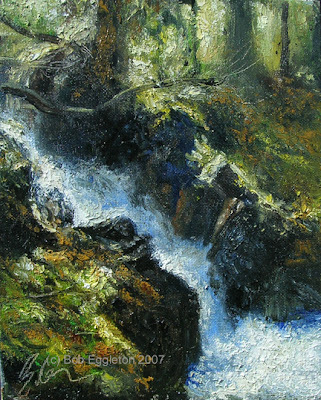 I LOVE painting water, and sometimes it's best to paint it as how you 'imagine' it to be. The Romantics did this all the time. I think it makes the piece better, and something you can't take a photo of! Been an ultra-busy time! However, I have a new piece drying in the studio, and I have to be out and around and doing some running around this week. At the end of it is Lunacon. So...if it seems I have abandoned things..I haven't. I'll have some new pieces up this week, and fun stuff to show. I'm doing a painting demo at Lunacon, so I'll get pix of that up as well! In the meantime if you are new to my blog, please look at my archives going back to December(see the links and such) so enjoy! 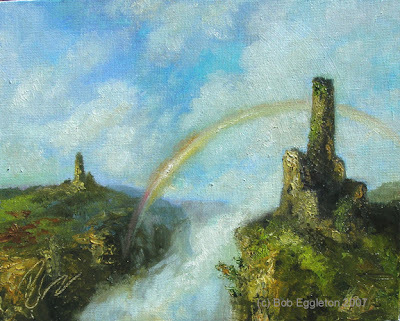 No, not Lord of The Rings...but, another castle idea...two ruined fortresses perhaps at one time at war, and now forever separated by an abyss...yet bridged by a rainbow. I love rainbows. Nature's play of light...refracted through moisture and broken down into it's spectrum. There. How's that for doing "okay" in High School science? Fun piece, Constable was my guide for the clouds. I know how this guy feels!!! The Fat Squirrel(9x12,oils,SOLD!) 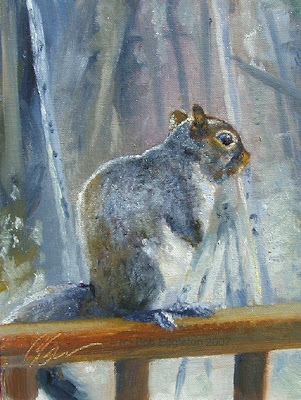 This is based on a photo taken by a friend, from MAine of a squirrel that sat on the railing of their home. You can tell this guy lives by the credo "Gather ye acorns" and he has. He's a fat squirrel!!! Anyway, I wanted to challenge myself in an hour, to do a squirrel as best I could. Seems to have worked. The fur was a challenge, so many artists render fur hair by hair, and in oils, fast, you have to look for the patterns that make the coat of fur up. It's gone freezing cold here, again, so I envy this squirrel and his fur coat. First wildlife piece in awhile....if you don't count mammoths. 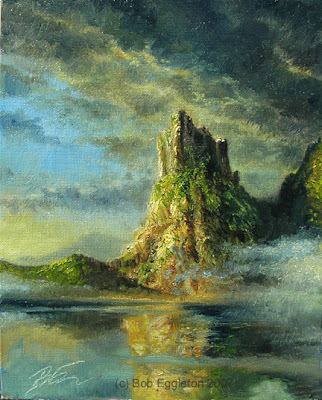 Castle Crag(8x10, oils, SOLD!) Maybe because I'm going to see Celtic Woman tonight...or maybe something else...but castles are fun to do. I see a nice lighting effect and want to kind of create a ruin around it and see how it looks. I wanted some puffy clouds in this one, and, a dragon as a request... all in all, a hour session on this one. 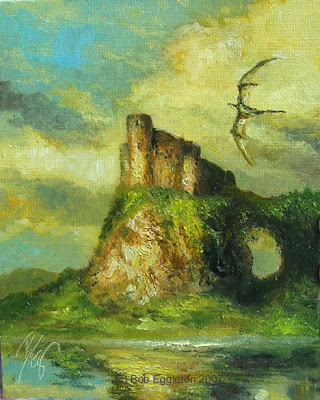 I felt like another castle ruin to paint, just to play with reflections and such. 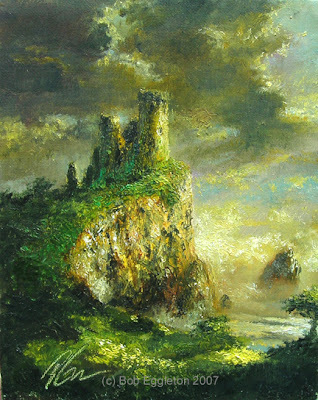 I borrowed a bit from Thomas Cole in terms of mood here. He would always successfully so, paint epic images of landscapes with stormy skies. 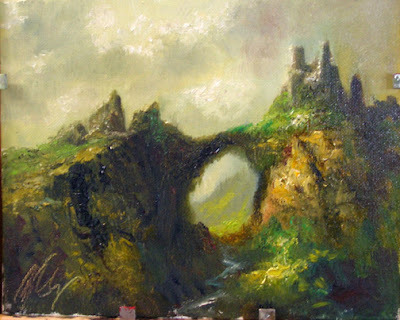 Again, I used palette knife around the rocks, and various media with the oils themselves. A note-I'm going to be more sporadic. Please do check in with my blog, but I'm coming into a "busy" time, so, I am fairly stating the paintings will be more like 3 times a week, maybe four if doable. I just don't want to feel like it's "one more thing to do", and I 'd rather put the joy into them. So, if a few days goes by and nothing new appears, fear not, I will be updating soon!!! This whole thing is for both yours and my enjoyment, so please bear with me-thanks!! A Line of Clouds and Trees. Well, finally we get back to paintings. Or I should say, I get back to them. Whatever. I did this Plein Air last Fall, in a small park. One of the banes of some plein air painters is a sudden crowd of onlookers when there was nary a soul minutes before. In this case, kids on bikes. It kind of threw me off, putting it delicately. But, I will say, they were GOOD kids who had NICE things to say. The "adults" seemed put out I was blocking their view. I also did not like the canvas I was working on. I should have had a panel to work on, but oh well. Speaking of green and nice skies...I smell Spring coming soon to a hemisphere near you!